The Scoop: Matchmaker Julia McCurley founded Something More, a privately owned matchmaking firm, to give discerning singles a more substantive alternative to online dating. The company is based in Austin, but it caters to elite singles across Texas. Over the last 10 years, Julia and her team have personally arranged over 3,000 first dates and seen hundreds of couples build loving relationships. In 2009, Julia McCurley left her job as a business development executive to start a matchmaking company that would help high-quality singles find high-quality dates. Something More is Julia’s gift to singles seeking a real relationship. She has put her people skills and headhunting ability to good use as a professional matchmaker based in Austin, Texas. 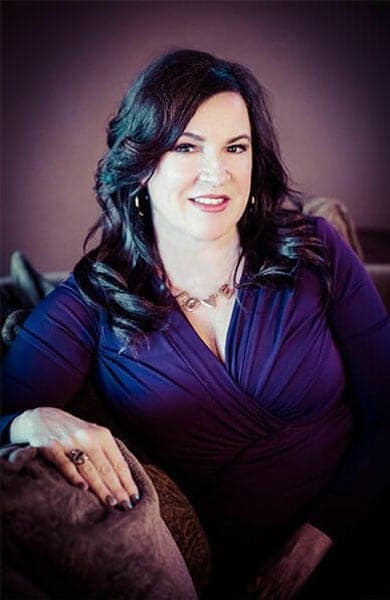 Julia earned her matchmaker’s certification from the Matchmaking Institute, and she firmly stands behind the boutique services provided by her firm. Something More’s hands-on approach to matchmaking appeals to singles who lead busy lives and don’t have time to mess around with swiping and chatting online. Something More is a time-saving solution for discerning daters interested in making genuine, lasting connections. Something More offers traditional matchmaking services with a personal touch. In the last 10 years, Julia has positioned her premium service as the anti-online-dating. The matchmakers use their know-how and experience, not algorithms, to hand-pick matches for their clients, and they offer advice and support throughout the process to guarantee maximum results with minimum effort. As more singles experience online dating burnout, the market is ripe for a premium dating service that can offer something more than endless matches and zero dates. When taking on a client, Something More’s matchmakers identify personal compatibility factors that are more than skin deep. They look beyond the superficial to pinpoint the qualities and values necessary for building a strong foundation for a relationship. Thanks to this quality-driven approach, Something More has set itself apart from the swiping culture on dating apps. These matchmakers dig deeper than first impressions. They are looking for the real deal and don’t settle for less. Their clients are interested, as the company name suggests, in something more substantial and lasting than a pretty face, so they do the legwork to make it happen. Julia McCurley started her career as a recruiter before making a splash in the dating industry. Many high-caliber daters turn to the Something More matchmaking company because they are burnt out with online dating. Maybe it works for some folks, but it hasn’t worked for them, and they’re tired of doing all the heavy lifting. Something More recently added a premium matchmaking service for clients who want to work one-on-one with Julia, who has over 20,000 hours of experience as a boutique matchmaker. Julia said she only takes on a few executive clients at a time so she can deliver a curated and attentive service. 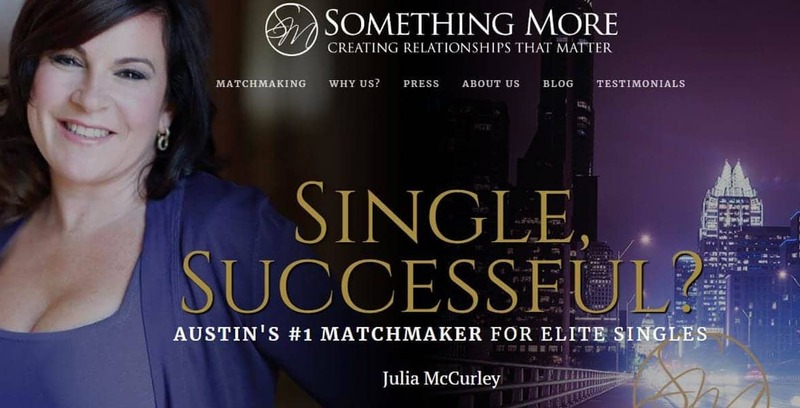 Julia and her team recently revamped the Something More website to reflect its focus on catering to the elite and inspiring loving relationships. The easy-to-use website walks singles through the matchmaking process and also highlights customer testimonials to show what can happen when someone invests in a professional matchmaker. Something More has arranged over 3,000 first dates in the last 10 years, and it has more than a few success stories from couples who may never have met without the matchmakers’ intervention. Something More has over 3,000 singles in its database, and the matchmakers take on 50-70 clients each year. The typical client is a highly successful, relationship-minded individual who’s too busy to scour the city for a date. These singles want to outsource the search for love by turning to professionals who can get the job done. However, not every client at Something More is ready for a relationship. Julia said sometimes divorcees merely want an introduction into the dating scene so they can regain their confidence. Some of them are still on the rebound, while others are rusty at dating, so getting some experience can be beneficial to them. Something More matchmakers give their all to ensure their clients have a terrific dating experience. The Fast Track program is designed to support divorced singles through that journey. This new program encourages clients to go on dates without jumping into anything serious right away. Something More’s end goal isn’t just to get clients in a relationship as quickly as possible — the matchmakers want to prepare individuals emotionally and mentally so they can make those relationships last. They offer advice to make singles feel more at ease in the dating world, so they can put their best foot forward on every date they go on. This well-rounded approach to matchmaking has helped singles gain confidence, maintain a positive attitude, and enjoy the dating process that much more. Julia has been in the dating industry for over 10 years, and she estimates that she has over 20,000 hours of hands-on matchmaking under her belt. That experience has given her a lot of wisdom about what’s going on in the dating scene, and she’s more than happy to share her thoughts with singles. She has gotten her message out through a variety of online channels and media outlets, and now she’s entering the publishing industry with her first book. Though the book’s title and a release date is still under wraps, Julia told us it will cover common issues in dating and relationships, and its self-help chapters will offer salient advice based on Julia’s professional expertise. 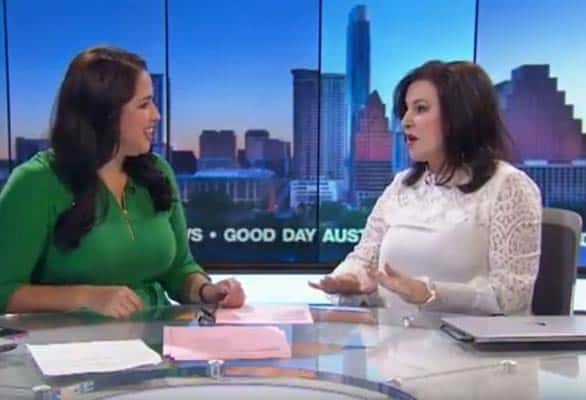 “Good Day Austin” on Fox 7 has featured Julia’s dating and relationship advice. In addition to penning a book, Julia has also become a more deliberate and diligent blogger who has lent her voice to Emlovz, Bustle, and other dating-related sites. As an esteemed local matchmaker Julia has made several TV appearances as well, including news programs on ABC, NBC, CBS, and FOX. Julia McCurley didn’t set out to become a matchmaker, but she felt called to the dating industry when she saw singles struggling to find love and happiness on their own. Now, as CEO of Something More, she has the power to relieve their burdens and remove the frustration from the dating process. Something More operates under the motto, “Creating relationships that matter,” and that’s exactly what the company has done for the last decade. Julia has built a legacy of success that satisfies career-oriented professionals hoping to find a worthwhile date. In the last decade, Something More’s curated matching system has proven itself effective time and time again. Julia and her team listen to the needs of their clients and provide instrumental guidance to help them reach their relationship goals, whatever those may be.